Funny, that. Because all down through history, “truth” has been a pretty reliable term. Until recently, it simply meant “the way things really are”, as opposed to “the way we may think things are” or “the way we’d like to imagine them to be”. Rational people believed in truth and irrational people didn’t. Science and logic sought truth, and superstition and fantasy did not. Creativity, imagination and speculation were on the side of irrationality; the thing that truth had on its side was its identical relationship to reality. All that was once well understood. But now (to parrot Anderson again) “reality isn’t what it used to be”. Nor is truth. Nowadays, we are encouraged to disbelieve in the whole idea of truth. And if that idea seems bizarre and far-fetched to those of us still accustomed to believing in a real kind of truth, just take a look around. Have a few conversations with today’s people. Talk to young people and children especially. And you will soon see that not only does the average Western person today not believe in the concept of truth, but they don’t even use the word in the ways we used to. For the Christian, this is a particular problem. After all, we follow the One who said, “I am the Truth”. To disbelieve in Christ as the unique, real means to know God is to reject the only road that actually exists — a tragedy for anyone. But I wonder if today’s person is even capable of understanding such a claim, since the very idea of truth is so up-for-grabs. A lot has happened to undermine people’s confidence that a unique truth can exist, or that anyone could know it if it did. And most of this undermining work has been done at the conceptual level … so that people do not even use the word the way they used to. I really don’t quite know whom to blame. This descent into unreality has happened gradually, incrementally, and for the most part, as a product of social changes rather than of deliberate propaganda. It’s been a whole-life kind of change, and for that reason has become more profound, persuasive and pervasive than any indoctrinator could have hoped to achieve by direct effort. Joseph Goebbels would be so jealous. How does one go from a normal epistemology — from believing in truth — to such an absurd point of psychological dislocation that one cannot even use the term coherently anymore? In two steps, I think. The first is to doubt what truth there is, and the second is to redefine truth as a kind of falsehood. Once the word has been successfully redefined in the public imagination, people can no longer even refer to it coherently. And the worst part of it is that we did not have the concept of truth pried from our hands by evil others, so much as we willingly surrendered it in order to remain comfortable in the midst of the technological, social, commercial and ideological upheavals of the modern world. Let’s look at these two epistemological missteps more closely. This lie has become so generally stated and so widely believed as to become a truism in itself. Today, if you say you believe in truth, you will find that most people will look at you in stunned incomprehension. It’s as if you had said you believe in fairies or alchemy. “No intelligent person believes any longer in truth” is just an aphorism everybody takes to be self-evidently … er … true. There are two primary reasons. Firstly, truth is taken to be bigoted. To say, “I believe in truth” is understood to mean, “I have my own prejudiced view of things, and I’m willing to force other people to believe it”. It just makes you a bad person. Secondly, and far more generally, people think that because they live in a world of many opinions and voices crying out about every issue, that in itself proves there is no singular truth. Now, if you’re intelligent at all, I know that sounds completely brain-dead, and you’ll have a hard time believing it. But test and you will find it’s so: the primary reason people today think there’s no truth is that they hear that there are many different opinions about everything — too many, in fact, to count. This is also an effect of information overload. 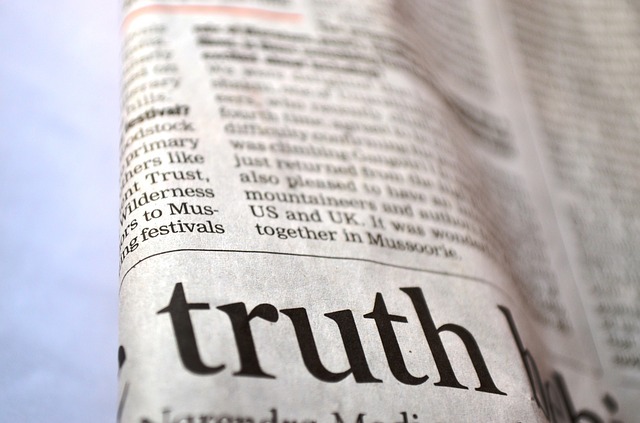 People today are awash in opinions from the press, from education and from the internet, and they become so confused by it all that they simply refuse to commit to any position firmly. When you’ve had the experience of thinking you were right about something only to find out later you were wrong or that there was another opinion you’d never considered, you tend to be a little more gun-shy about pulling the trigger and taking your next firm stand. Let it happen to you enough, and you become completely gun-shy, wary that however strongly you may believe something, some new opinion or voice will emerge in the next minute that will prove you wrong: and nobody likes to be made the fool. So in a world of practically infinite amounts of information, it just looks like good sense not to believe anything, or state anything, too strongly. You tend to keep your position loose, your feet light, to move to the next position if it should suddenly become clear that that is what you need to do. “That’s not quite what I meant,” we say, when all along it was; then we shift position to something our hearers are more likely to agree with: “What I meant was that …” And adopting this conversational style keeps us from playing the fool by being proved wrong — or if not proved wrong (which is now less and less a concern, since we assume truth doesn’t exist anyway), at least shamed and defeated by confronting an argument for which we were simply not prepared. You’ll see this conversational style replicated over and over on websites and blogs on the internet. In fact, it has become the dominant style of our day — speak as stridently as you like, but then disavow the literal meaning of what you said and shift to a new ground as soon as you are afraid of defeat. And this is actually a third cause of our current relativism about truth: fear of being caught out of the herd, of being defeated, shamed or pilloried in a public way. For the internet always feels public, even when no one in particular is paying attention. And shame there always feels worldwide. Media critic David Shenk has proposed an interesting explanation of this phenomenon. In his 1997 Book Data Smog he refers back to the 17th century debate over epistemology between Rene Descartes and Baruch Spinoza. Descartes thought human beings were primarily reason-driven. When they hear a new idea, he thought, they comprehend it first, then assess it, then accept or reject it. Spinoza disagreed. He believed human being simultaneously comprehend and accept an idea — that is, the very act of understanding what it is saying involves a kind of believing process — and only afterward, if we have time to think and reason to do so, do we un-accept it. Descartes held that human beings are essentially critical beings; Spinoza, that we are essentially believing beings. Everything since the 17th century really backs Spinoza. Two cases will show this. Firstly, there’s the stupidity of advertising. Everyone knows that the actual messages advertisers send us are stupid: “Eat Sugar Flakes and you’ll play great hockey”, “Brush your teeth with Gleem and you’ll get a boyfriend”, and so on. On their face, no one would ever believe them. As stupid as it is, however, advertising works. (If you’re a company that has a multi-billion dollar-a-year product, and you’re paying five million dollars for a thirty-second Superbowl slot, you surely want to know whether or not what you’re doing is going to work.) But how does it work? Not by being intelligent, or by making claims people can weigh rationally, but by making extravagant claims in the midst of barrages of other information, giving the viewers no time to process critically what it is you told them. They have time to comprehend and, as Spinoza said, to accept — they do not have time to process and un-accept, because the show keeps moving. The overwhelming pace of information flow allows only enough time to believe … not to evaluate critically afterward and reject. Getting their messages into the middle of information flows is what modern advertising is all about. Whether on TV, buried in a movie as a product placement or slotted into the Internet amid other, more relevant information, advertising does its work by using the torrential pace of the download to subvert the viewers’ critical faculties. So that’s one example of Spinoza’s view. A second is the phenomenon of “the really”. A “really” is when you say something outrageous to another person, and their instantaneous response is “Really?” The more outrageous and stupid the statement that elicits the “really”, the higher the hilarity when the recipient responds, “Really?” The joke is that someone could, for even an instant, be induced to believe something so utterly preposterous. You get the idea. And believe it or not, both of the above statements worked. But “realies” wouldn’t work at all if Spinoza were not right: people who aren’t paying close attention tend to believe at the same time as they comprehend an idea, and only process the sense of that idea afterward. That’s human nature. There was, however, a way to beat the “really” game. All you had to do was to adopt a doubter’s perspective toward every statement that your friends made. By never saying “Really?” you could be kept from becoming a fool. But this also, of course, had a serious detrimental effect on your conversations and general trust-level with your friends. Modern people are Spinoza’s credulous hearers: but they’ve also been “realied” too much. As a self-protective measure, they just don’t believe anything much anymore. Paradoxically, this also means that whatever they do believe has come to them by way of comprehending the concept in the first place, not so much by way of having critically evaluated it. Their residual truth commitments are primarily composed of stuff that somehow got around the cynical wall they have raised to protect themselves from being misled, and thus is both believed very deeply but also has never been adequately processed by their critical faculties. If they say yes,then there IS a truth — namely the truth that all truth is relative. But if that is so, then even the truth of relativism must be relative: in which case, it’s not actually true. So relativism of this sort immediately defeats itself. When something is self-defeating, you’ve got as clear an indicator as you’re ever going to get that it’s simply nonsense. It’s not true. Nevertheless, the perception that anyone who believes anything so strongly that he says it’s actually true — not just temporarily “true”, “true” for him, or a “truth” he happens to like but others are free to reject, but true now and forever, true for everyone at all times, like the truths of mathematics or the actual facts of history — such a person must obviously be a bigot and a fascist. Nothing else could explain why he would want to make other people accept his “truth”. And such a one, it is thought, can be freely hounded from our midst as unfit for decent relations or normal conversation. In spite of its essential irrationality, there are certain payoffs that make skepticism about the existence of truth rather attractive. It’s popular, part of the “common sense” perception of our day, it’s a route of low friction, and it sponsors certain lifestyle choices that many of us prefer — in particular, multiculturalism, individualism and laissez-faire consumerism. You could even say it’s sort of “adaptive”, given our current social ethos. So it’s attractive. The problem is that we just cannot actually live without the sorts of benefits belief in truth affords: things like science, justice, rights, coordination on facts, grounds for protest and above all, some agreed-upon way of assuring ourselves that we remain ‘good’ people. And that’s why (post-)modern man has invented a way of bringing back something like truth to fill its place. What is that? We’ll see this tomorrow, when we turn our attention to the second epistemological misstep of our day. Of course, if a philosopher wants to explain or deal with human behavior it will be with philosophical terminology and with the assumption that people care about and/or understand what the philosopher is trying to get across. Since I think that that is a tenuous assumption, I will add something that I think is a bit more realistic, namely a bit of pragmatism. From my (pragmatic) observations I have concluded that human behavior is mostly determined by what I have previously called the convenience factor in a person's life, or the converse, how inconvenient (and less comfortable) life will be for me if adopting a viewpoint and/or perform, or do not perform, a certain action. Morbidly obese person, 6 ft. tall male, friendly, verbose, socially connected and weighs 450 lbs. His job involves quite a bit of public speaking. Advise, encouragement and concern by friends to make different lifestyle choices falls on deaf ears for years. Lately considerable difficulties standing during speaking engagements, needs to sit down. Then, one day a call to management office where an alternative is given, accept help in improving the weight problem or face the consequences. The offer is to attend a paid-for 3 week seminar at a weight clinic for actual weight reduction and concomitant follow up strategies or lose your job. Offer is accepted. Following the seminar the person adopts a methodology of light exercise (mostly in pool) and caloric intake reduction using the calorie counting techniques learned in the seminar. No other strategies are used other than primarily counting calories with a greater emphasis on vegetables and fruit. Within 3 to 4 years the person has reached a weight of 200 lbs and is holding steady. The job has been saved and there is a substantial increase in personal pride and satisfaction. Same circle of friends and acquaintances this time involving a morbidly obese female 5ft 4" tall at 350 lbs. She is familiar with and has observed the progress of the aforementioned male. Similar continual concern and encouragement from friends are without avail. Doctor suggests he can help even surgically but insists she must first lose some weight before the procedure. Offer is declined. Friends suspect a pathology is underlying the behavior. When eating out, a rare one inch thick slab of prime rib or steak is the consistent fare with no moderation concerning accoutrements and deserts. Mobility, movement and demeanor is that of a handicapped person using walker and wheelchair eliciting sympathetic responses wherever the person goes. The pathology is a complete denial of excessive caloric intake and an apparent relishing of the attention and sympathy due to the perceived handicap status. Suggestions by friends to adopt the strategy of the successful male acquaintance are angrily brushed off. This person does not have a job but was working at one time. There is not even a slight acknowledgement that a change in attitude and behavior would be beneficial. The point here is that a philosophical perspective of truth is completely irrelevant to most people and what counts is that human beings are mostly reactive to external circumstances concerning how they affect their comfort and convenience, which means they react to external and internal pressure. This is why people go along with a holocaust, abortion, overpromising leaders and charlatans. That's why it is possible to intimidate or to seduce people. These traits among other things are clearly linked to mental sluggishness, weak will, selfishness and lack of altruism, all the niceties brought about by the biblical fall. So, philosophers are probably better off maintaining a conversation among themselves then thinking that the general public will benefit from their conclusions. A couple of good stories, Q, but as a good friend of mine is fond of saying, "The plural of anecdote is not data". Anecdotal, yes, but your friend is wrong if implying that such evidence is therefore automatically without proof and not well established. Anecdotal evidence can of course also add to a well established and proven body of evidence, which is the case here. See excerpts below from provided link concerning that. My conclusions concerning how truth can be and often is/is not incorporated into a person's outlook and life therefore stand. There are both formal (philosophical) and informal (common-usage) definitions of the term "pragmatism," Q. I think you might be using the two interchangeably, which, if I'm correct about that, would incline you to non-sequitur conclusions. What I'm aiming at here, in mentioning pragmatism at all, is the philosophical framework, not the common usage. But my mention of it is very brief, intended only to cover those with the philosophical background, who are not my main audience. So pragmatism isn't the core of the argument. Rather, it's an aside. Philosophically, I doubt you're a pragmatist. For pragmatism is, by it's very nature, amoral -- and I have found you to be both morally earnest and spiritually interested...things philosophical pragmatists are not. Finally, from the perspective of the study of truth and what we know about it (i.e. epistemology), pragmatism is very easy to defeat. For as I suggested above, it cannot even begin to ground a definition of what "works" that cannot be quickly assailed and devastated by anyone who thinks differently from any particular pragmatist. So if you were thinking of camping on pragmatism yourself, let me suggest you'll find it an uncomfortable place, one ill-suited to your personal lifestyle, and also philosophically a "house of straw." Perhaps I should have used the word Practical instead. A philosophical discussion involving truth is simply not what motivates most people in their daily living. In addition there is also a time horizon involved when choosing whether or not to abide by the truth. When the consequences are far off, as with smoking or gluttony, then the truth about those habits is ignored, at least for now. 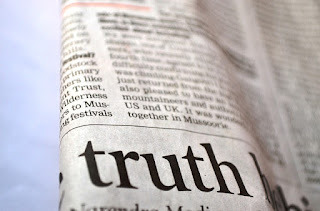 It often seems to come down to Pilate's "What is truth" which itself is a catch 22 because you need the truth to answer it and that will trip you up later on when you have to face the consequences for asking that question. Actually I don't see anything wrong with the definition of pragmatism starting with the second sentence of the definition (see below). Starting there it describes exactly the approach and methods I used in my technical work without having had the negative connotations that you imply. As a matter of fact that portion of the pragmatic definition seems to be exactly what is needed in any field that requires a thoughtful and analytical approach. However, I strongly disagree with the first sentence since it is self-contradictory with the next two sentences. That is because describing, representing and mirroring reality is precisely the function and end result of the approach outlined in those last two sentences. I am therefore amazed by the self-contradictory nature of this definition and attribute it to the fact that it was created by someone with little practical experience, namely a philosopher ^_~. Pragmatism rejects the idea that the function of thought is to describe, represent, or mirror reality. Instead, pragmatists consider thought an instrument or tool for prediction, problem solving and action. Pragmatists contend that most philosophical topics—such as the nature of knowledge, language, concepts, meaning, belief, and science—are all best viewed in terms of their practical uses and successes. I don't think anybody's got anything bad to say about being "practical," Q. In fact, objective definitions of truth aim at that very thing. The tight link between reality and truth assures that...for nothing is more "practical" than to conform one's views to the truth about reality -- whether that reality is about abstractions or concrete things. The problem I see is that, as you say, "A philosophical discussion involving truth is simply not what motivates most people in their daily living." That is probably accurate to say, but it means something rather problematic for our grasp of reality, and hence of our ability to be genuinely practical: it means we're lying to ourselves about truth, and that "most people," as you put it, are simply unwilling to exercise the minimal level of "philosophical" inquiry to question that. If what you say is true of the general public (i.e. "most people"), I'm going to step forward in faith and say it might not be so true of the average reader of this blog. I'm not so cynical as to believe people cannot think, should they choose to do so. The point of these two posts is to show just how far the "most people" kind of understanding of the truth concept has moved away from common sense, and indeed, from anything practical. And it's a necessary argument to make, I think; because people can hardly correct for the self-contradictory and absurd postmodern views of what truth unless they interrogate the suppositions of those views, right? In short, it's not practical to proceed on a definition of truth that is simply untethered from reality. I think we'd both agree on that. Interesting that this topic comes up again, probably because it is indeed becoming more and more relevant even though it has been recognized already for a long time as Einstein's quotes above show. I actually have a bit more to add to it. As to your points namely the tendencies you describe, and your suggestion that they are getting worse implies to me that they therefore must in themselves already contain their solution. The reason I am using the word Must is because let us not forget who we are dealing with when you use the word Truth. You are dealing with what the physicist describes as an irresistible force and by no means is there the danger of an immovable object stopping that force except under the object's own free will. I see the solution as having the nature of a control circuit feedback loop (like a thermostat) so that when things get too hot (too wrong) the control circuit will lower the temperature. The two world wars certainly got too hot but the circuitry worked. I think this is built in, inevitable, and unchangeable even if it looks hopeless for the moment. In other words, it is foreordained that good will triumph over evil no matter what. To me that is consolation. Btw, lately I have noticed that reference web links, like I had provided after the From for the above Einstein quotes, no longer show up here. I don't remember this being the case previously. So is it a housekeeping change, was it always standard procedure, or is it my OS (Windows 10). I see what you mean. It's definitely not deliberate. They simply vanished when I posted your comment. Will try to figure it out when I'm back home. My Kindle is useless for troubleshooting technical probe.